You can sit in the best kayak all day and never go anywhere unless you’ve got the best kayak paddle for the money helping to propel you forward. The best kayak paddle may be different for you depending on what your unique situation happens to be. Even environmental conditions can affect which kayak paddles should be chosen. Everyone tends to have a friend who thinks of themselves as a Salty Dog who can provide expert advice. Let the original Salty Dog show you what the best kayak paddles happen to be in the chart below. What Are the Basics of the Best Kayak Paddles? There are two points of consideration here: the composition of materials in the paddle and the blade design. Paddles can be made from fiberglass, carbon fiber, or some form of plastic or aluminum. The plastic and aluminum paddles tend to be the cheapest and they still have a good level of durability. Carbon fiber paddles are the most expensive, but they are very light and incredibly strong. The design of the blade is also something to consider. They can be feathered or non-feathered. Most experienced kayak enthusiasts are going to opt for the feathered blades because they aren’t on the same plane. This lends to more overall control and more efficient paddling. Non-feathered blades are good for learning the process of paddling. What Are the Best Kayak Paddles For Me? Don’t get all worried about finding the best kayak paddles. It isn’t a complicated process and even the newest beginner can quickly find the right equipment to use. Much of it depends on your paddling style and the shape of your boat. Low-angle kayak paddles. These paddles are a bit flatter so that they enter the water at a lower angle than other paddles. This offers a slow cadence and a relaxed, almost effortless paddling experience. High-angle kayak paddles. For a faster cadence when more speed is necessary, these paddles will help with maneuverability. They also require a lot of physical stamina over the course of an afternoon. Your height matters. How tall you are will dictate the size of the paddle that you need. Most kayak paddles are measured in centimeters and those over 6 feet tall typically need a longer paddle. The width of the kayak matters. A wider kayak needs a longer paddle for the sake of simple physics. If you can’t stick your paddle in the water from a seated position, then how are you going to be able to propel yourself? Most kayak enthusiasts over 6 feet tall will need a paddle that is at least 220cm in length. Wider boats and the angle of the paddle will dictate increases in length from there. What Are the Prices of Kayak Paddles? Many kayak paddles are incredibly affordable. If you are purchasing a new kayak, you’ll often receive a free set of paddles with your purchase. If you need replacements or aren’t getting free kayak paddles, then you can expect to pay about $50 for some good paddles, but the materials from which they are made will affect the price, as will the design. With a shaft made of tempered aluminum and polypropylene blades, these kayak paddles are surprisingly let, yet still strong and easy to control. They are available in sizes from 220cm-240cm and provide a quick hand placement with a firm grip option. They’ll break down for transportation or storage, but at 72 inches in total length, they still take up a bit of space. 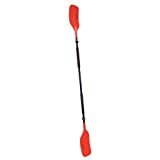 It’s a good, convenient paddle and tops the kayak paddle reviews for that reason. Anything that has “Extreme” in its name should be awesome, right? For once, the marketing hype is fitting for a product, as evidenced by these great kayak paddles. They have a feathered blade design and adjustable drip guards that make them easy to use. The support ridge that’s been included in the design creates a stronger paddling experience and there are three different locking positions available for these paddles. You won’t find a more versatile set on the market today. These are pretty basic paddles, but they will still help you to propel your kayak pretty effectively. They have foam grips for comfort that don’t get slick when the water hits them and drip guards will help to make sure you stay dry. It’s got a three-position system that locks into place and can be broken down in half for storage. The latch that locks the paddles into place can be a little cumbersome, but overall the paddle is intelligently designed and that’s why it is one of the best kayak paddles around. If you want a longer paddle for your kayak that just has one paddle instead of two, then this standup paddle is a viable option. It adjusts out to 83 inches in length if needed and works for boarding just as well as it does for paddling. It does weigh over 40 ounces, so it is a little on the heavy side, but you’ll be able to get up to speed in no time with this great paddle. This deluxe kayak paddle offers everything that a good paddle should, but there’s one exception. The paddle blades aren’t in a fixed position, which is why they are one of the best kayak paddles available right now. You can create the low or high angle entry that you need so that you can get more movement with every stroke. They can even be setup for offset paddling, and at this price point, all of the features really are difficult to ignore. To go anywhere in a kayak, you need to be able to paddle. By knowing what kind of paddle to choose, you’ll be able to meet this need effectively without breaking your budget. That’s the advantage of knowing which ones are the best kayak paddles on the market today.